Hurlburt said in the release that the Block 30 Ghostrider has better software and avionics technology than the previous Block 20 version. In a follow-up email, Staff Sgt. Victor Caputo, spokesman for the 1st SOW, said the Block 30 version has a new sensor, updated crew seats with additional safety features, and new technology, routers and networks. Caputo also said the layout of the latest Ghostrider has been reorganized to move equipment out of the way, including installing racks to free up cargo compartment space. But while the Pentagon previously said the Block 30 version of the AC-130J would have the capability to carry wing-mounted AGM-114 Hellfire missiles, it is unclear whether the Ghostrider that was delivered last week does. Hellfire missiles were not included in the list of Block 30 features provided by AFSOC. The Ghostrider will represent a major upgrade over the AC-130U Spooky currently used by the 4th SOS, which AFSOC said is the Air Force’s most deployed squadron. The AC-130J can carry out the same close-air support, air interdiction and armed reconnaissance missions that the Spooky now performs, but with better avionics, navigation systems and weapons. The Ghostrider’s “Precision Strike Package” includes trainable 30mm and 105mm weapons. The AC-130J’s six-bladed turboprop engines help it operate faster and much more efficiently than the Spooky, according to AFSOC, and it burns 25 to 30 percent less gas than previous models. The AC-130U Spooky is slowly being retired from active duty after more than two decades in action. AFSOC Commander Lt. Gen. Brad Webb greeted the Ghostrider’s aircrew at the unveiling and addressed the crowd at the airport. He accompanied the air crew on the flight from the airport to Hurlburt, and spent some time behind the controls during that flight. This Block 30 Ghostrider will be tested for a year before it can be deployed operationally, AFSOC said. The Air Force declared that the Ghostrider had reached initial operational capability in September 2017. 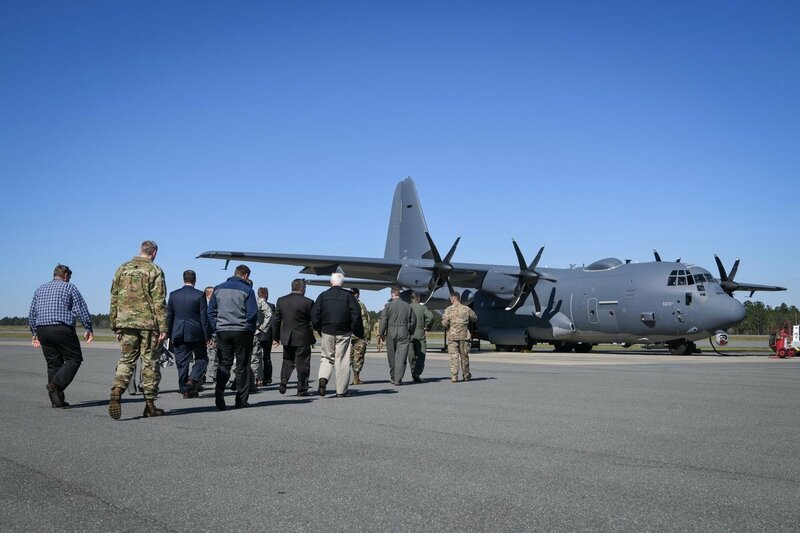 The 73rd Special Operations Squadron at Hurlburt, which was reactivated in February 2018, was the first squadron to operate the AC-130J. It received a Block 20 version.